If a photo is worth a thousand words, a balloon is worth at least that many smiles. 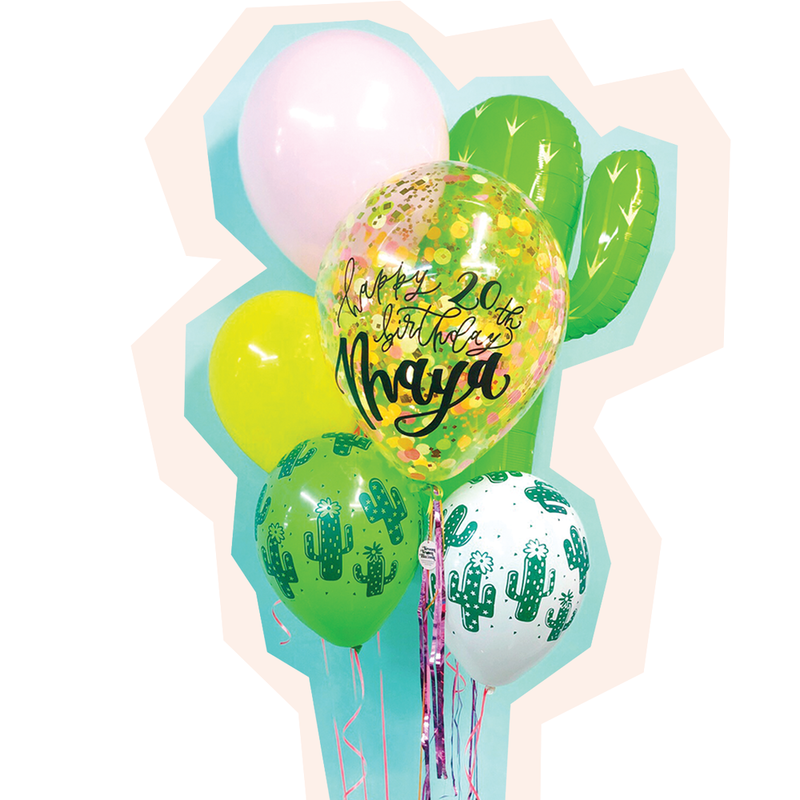 $65.00 - Our most popular balloon with a fresh greenery twist! And, no, you won’t find any fake floral at VVB- all of our tails are live. Perfect for weddings, baby showers, engagement parties and modern birthdays. $60.00 - Standard Gustave includes paper/metallic tassels, personalization, big balloon and weight. $60.00 - Those boring ole' number balloons just got a whole lot more luxe! You no longer have to worry about a backwards “6”, because we’ve taken care of the styling here. With 4 coordinating tassels, these jumbo numbers look incredible in photos. $75.00 - Standard Gustave confetti. $70.00 - This celebratory bouquet is sure to bring cheer! It features a medium confetti balloon with personalization and tassel, jumbo mylar, coordinating latex on a weight. Popular ideas: unicorn, under the sea, bachelorette/bridal diamond ring, beer, champagne, rainbow, celestial crescent moon, etc. With 1+ week notice, we can accommodate almost any theme! This is not an actual order. Within 5 business days, a balloon stylist will call you to provide more information + process the order. Events in less than 2 weeks: call 615-955-0565. Orders can also be placed in person at the VVB Bar located in Harland Ruby: 805 Woodland Street, Suite 301, Nashville, TN 37206. Pick ups are offered by the 15-minute time slot M-F 10:30am-5:30pm and Sat/Sun 9:30am-2:30pm. Standard deliveries are a 2-hour window M-F 10:00am-6:00pm and Sat/Sun 9:00am-3:00pm. Pick up and delivery is available outside these windows upon request. Please let us know what kind of budget you are working with. Vroom Vroom Balloon works with all clients to make something beautiful for any price range. One color or thirty - we love them all! Tell us what you are dreaming up, so we can make it happen. Some clients know exactly what balloons they want; others prefer to provide a budget and let us be creative. It's totally up to you! Feel free to be as detailed as possible, or let us know you trust our skills + opt for "Designer's Choice"